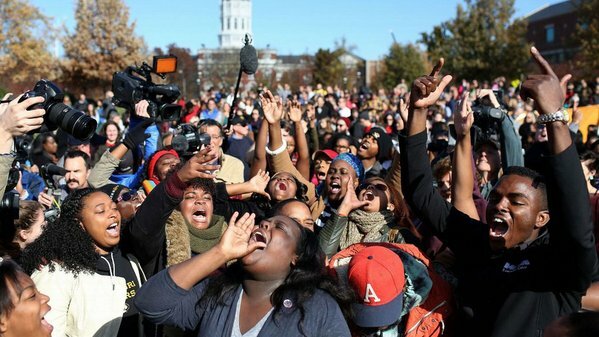 In November angry race protesters at the University of Missouri in Columbia forced the campus president and chancellor to resign. Admissions to the university are down for the coming year by 1,500 students after the protests. The University of Missouri announced in April it will close two dorms in the fall semester. The latest numbers show enrollment at Mizzou next fall fell by 22% after the far left protests. But that didn’t stop the interim president from attacking former students and those critics of the race protests as “bitter” and “angry” people. President Michael Middleton was behind the protests from the beginning and made a video to support the protests in the fall. Last fall, the University of Missouri was rocked by race protests that helped topple the president and chancellor, and sparked a backlash that included drops in enrollment and a retreat by some donors. Perhaps Middleton, who was speaking to the National Press Club, shouldn’t be so quick to dismiss that latter group of people, which includes scores of dismayed donors, alumni, parents and prospective students. Mizzou’s interim president acknowledged that the university is facing a $30 million funding shortfall because of decreased enrollment in the fall, which is, in part, a reaction to the protests. New records reviewed by Heat Street suggest Mizzou’s dearth of support may run even deeper. Wholesale purchases of Mizzou-branded apparel and gear (sold via retailers that are licensed by the college) are down after the protests, as are ticket purchases to sporting events.